But the topic I chose was one I took very seriously, because it was something that had been on my mind throughout the election and even more so in the weeks and months that followed, as I searched for my next path. Before joining the campaign, I’d quit my job as Director of Communications at a fast-growing digital marketing agency, for reasons that included a vastly different set of values from my employer. And no matter how physically and mentally grueling the job of a campaign organizer was, I was never more fulfilled in my entire life than those months I spent working 16+ hour days to elect Hillary Clinton and Democrats all the way down the ticket in what I believed was the most monumental election of my lifetime. One of the silver linings of that job, including never worrying about if I could have done more (I pushed myself past 110% effort in every way, every day), was the realization that there are indeed options for people of strong convictions to make a living — without compromising their values. So I wanted to talk about finding the right way to speak up while being a professional, about bringing your values into your work. In the few months since my campaign job had ended, I’d already witnessed the benefits of being vocal about my beliefs. My dream clients were showing up, knowing already that I’d be the best advocate for our shared values. And I was on a mission to give those who saw my talk permission to be politically and socially engaged, to whatever degree they were comfortable. 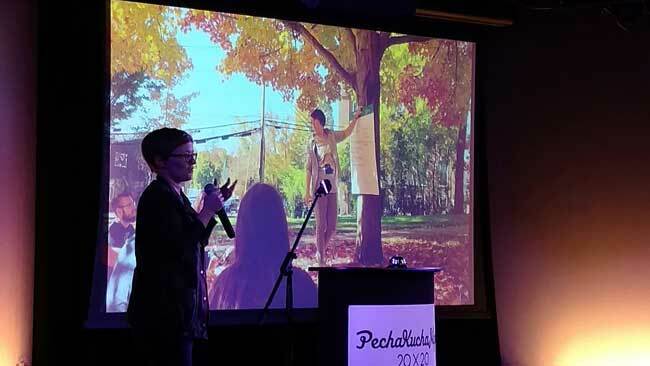 This talk was given at Pecha Kucha Night (PKN) Portsmouth #28, at 3S Artspace.